Petermann Fjord is within sight and at least 5 ship-sized segments from Petermann Glacier are around us drifting to and fro with the tides. RadarSat imagery received this morning aboard the CCGS Henry Larsen indicates that the Manhattan-sized ice island PII-2012 has moved over 3 nautical miles seaward in the last 36 hours (5 kilometers per day) during winds from the south-west. The north-eastern tip of PII-2012 has left the fjord past Offley Island. 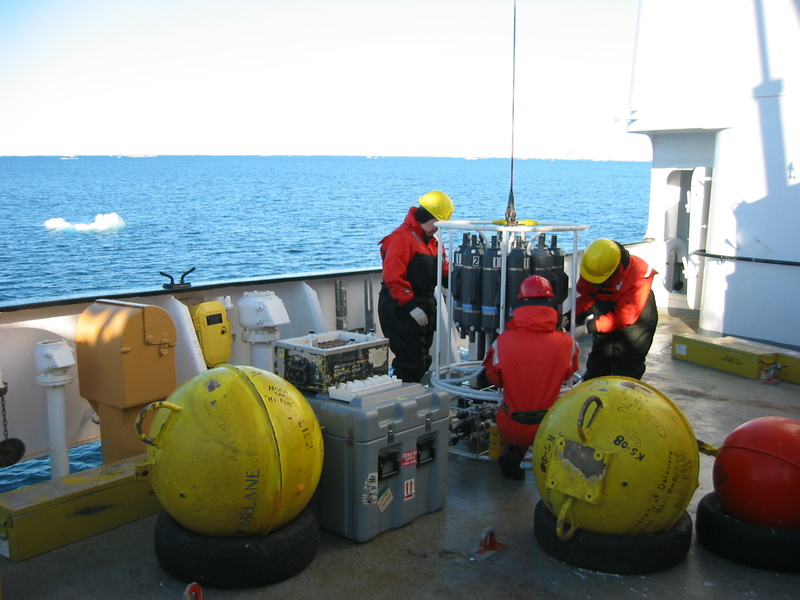 We are about 20 miles to the south at 81 degrees 14 minutes north and 65 degrees west firing bottles to collect water samples across a section that Petermann’s ice island PII-2012 will cross perhaps as early as the next week. Dr. Renske Gelderloos just tells the bridge from a van on the fore deck, that all 12 bottles have been fired as the instrument package traveled from the surface to 451 meter depth and back. Additionally, we collect temperature and salinity more continuously as an electromagnetic sensor is lowered via the same cable as the bottles. I am one of two winch operators while Dr. Gelderloos is the command and control center next to me operating 3 laptops concurrently. 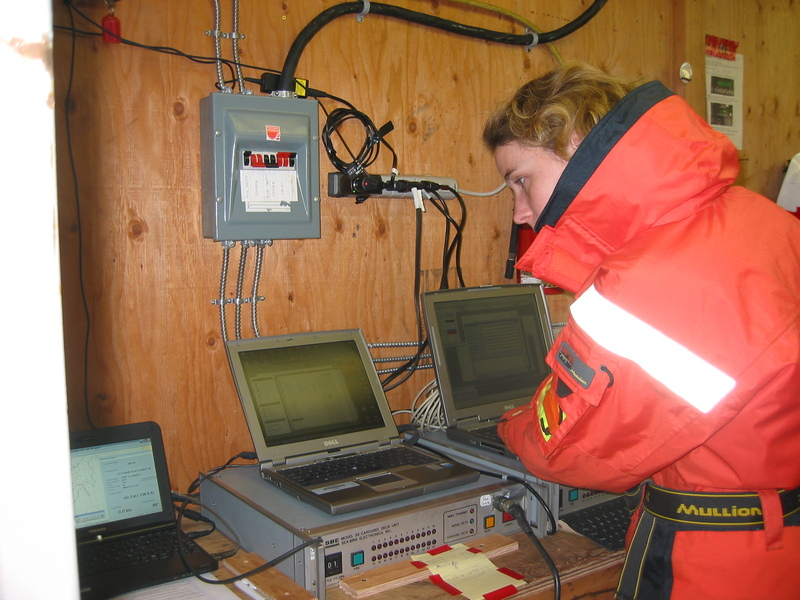 Dr. Renske Gelderloos of Oxford University in command and control of data collection operations aboard the CCGS Henry Larsen. Pat Ryan (left), Humfrey Melling (center), and Allison Einolf (right) collecting water samples aboard the CCGS Henry Larsen in Hall Basin in August 2012. PhD student Patricia Ryan, dressed in a warm Mustang suit, is one of the water samplers to transfer water into tiny sample bottles for later chemical analyses. She just hands me a USB JumpDrive with 3-years of data of temperature, salinity, and pressure from a moored sensor we recovered yesterday. The latest profile is completed and I am off to process the new data further. I missed dinner at 5pm, because it took us 5 hours until 8pm local time to finish the 7 stations of a section from Greenland to Ellesmere Island, Canada. I am back to writing now at 11:35 pm local time after lots of cheerful banter, quick clean-up for the day, 2 beers at the bar, and an hour staring into Petermann Fjord from the west-by-northwest. I can’t see the ice island even though I see Offley Island and I know the ice island is right next to it. The ice sheet spilling over the vertical walls of Petermann Fjord are visible in the distance, too. It is raining now. Air temperatures are 0.7 degrees Celsius (about 34 Fahrenheit) which is a little cooler than is normal for this time of the year. We are now another 50 km to the north at 81 degrees and 44 minutes North latitude that is farther north of Petermann Fjord and its ice island. This entry was posted in Ice Cover, Ice Island, Nares Strait 2012, Petermann Glacier, Polar Exploration and tagged Nares Strait, Petermann Glacier. Bookmark the permalink. Won’t clog up your connection with a lot of questions now, but take lots of pics & stay safe. You remember telling once that the Petermann calving was a silent movie, from what I know about ice calving cant be true, from the material you sent me ( Coppinger.) and and old reports from Storstrømmen (1908) I can tell you just the movement of the glaciers this size makes sound/noises that scares even dogs and horses, and we are not talking about calvings. So we can conclude what differences chopper inspections and sleeping in icebreakers makes?